The DIR/EIS comment period ends July 6. Metro board members are expected to vote on the project in 2016. As home healthcare workers continued to push Tuesday for a wage hike from $9.65 to $15 an hour, Los Angeles County’s interim CEO laid out some of the other claims on county coffers, including $27 billion in unfunded retiree benefits. Sachi Hamai said the county could ultimately risk a downgrade in its debt rating if it failed to fund that long-term liability, which is based on the cost of providing benefits to past, present and future employees. Other big ticket items that need attention include a jails plan that could cost $1.8 to $2 billion, replacing outdated technology and meeting minimum and “living wage” demands of county employees. On top of that, the county has $640 million in deferred maintenance projects. 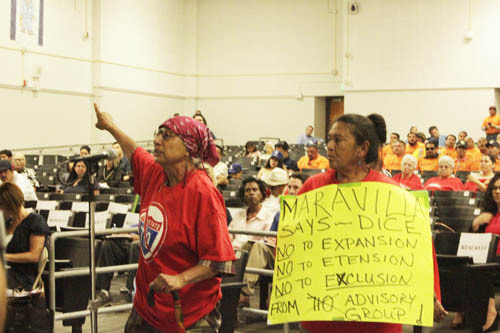 “The inventory is large and old,” Hamai told the board, with more than half of county properties built more than 50 years ago. Only about one-quarter of the 2015-16 proposed budget of $26.9 billion is spent at the county’s discretion, Hamai said. About $9.5 billion is federal and state funding for designated programs, while roughly $10 billion is tied to specific uses. The county uses some of that discretionary revenue — generated primarily through property taxes — to meet required matches for federal and state funding. That leaves roughly $3.9 billion for the board to allocate, Hamai said. Paying in-home supportive services workers — who care for those who otherwise would likely be sent to a nursing home — $11.18 an hour would cost $43.1 million this year. To phase in increases to $13.25 and then $15.25 over the next two years would cost $211 million and $374 million in 2016-17 and 2017-18, respectively, according to Hamai. International Union-United Long-Term Care Workers, have been negotiating a raise for months and dozens assembled again today outside the Kenneth Hahn Hall of Administration. Workers told the board about the work they do caring for the elderly and disabled, some of whom are members of their own families, and how hard it is to make ends meet on $9.65 an hour. “Nursing shoes cost two days pay,” said one woman who told the board she works 60 hours a week but still can’t afford new shoes or an eye exam. Paid through a state program, the home care workers would not benefit from an increase in the city or county’s minimum wage. 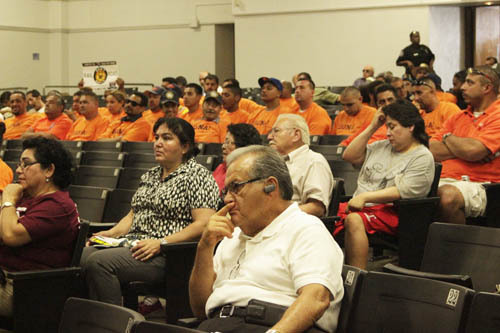 Others warned that not raising wages would end up costing the county more in the long run. “Would you rather for us to be out on the street and homeless?” asked Sharie Washington. Union research shows that 81 percent of the in-home care providers live in poverty, 33 percent rely on public assistance and 18 percent depend on food stamps to feed their families. A study released by union leaders today concluded that a raise hike to $15 would generate $768 million in local economic activity and support the creation of 6,000 new full-time jobs. “Because a large portion of these salaries are supported by the federal and state government, putting L.A. County’s home care workers on a path to $15 an hour is a win-win for all local parties — the county, caregivers and the local community and economy,” said Chris Thornberg of Beacon Economics, which conducted the analysis. No action was taken on the proposed IHSS raise, but Hamai said other programs would have to be cut in order to pay home care workers more. Projections by the CEO’s office showed county revenues roughly keeping pace with cost increases for existing county services over the next five years. However, funding retiree benefits, dealing with deferred maintenance, financing a new jail treatment facility and paying for all the other future needs would result in a deficit of more than half a billion dollars by 2019-20, according to the estimates. 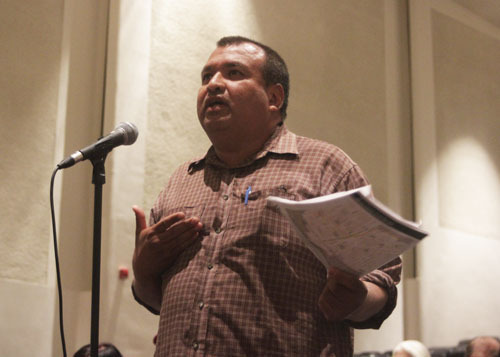 “Future budget demands now under consideration will require difficult decisions on existing priorities and services,” Hamai told the board. Caltrans and Metro released a draft environmental study of proposals to address the 4.5-mile gap between the Foothill (210) Freeway in Pasadena and the end of the Long Beach (710) Freeway in East Los Angeles. —a freeway tunnel that would extend the 710 Freeway. However, opponents of the project say they believe the decision will ultimately come down to the tunnel alternative. Janet Ervin from the “No 710 Action Committee” told EGP that the instead of relieving traffic in the area it will become a new bottleneck attracting more congestion. “You can’t build your way out of traffic,” she said. But proponents of the project like Celine Cordero of the 710 Coalition believe the freeway must be completed as soon as possible in order to “close the gap” in the region. 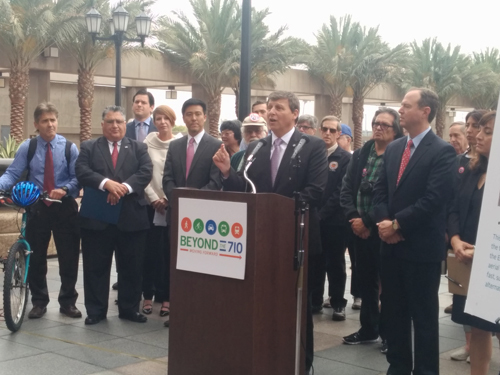 Last year, in a letter addressed to 710 Coalition members, Commerce Mayor Tina Baca Del Rio said the city “strongly” supports the completion of the gap between the 710 and 210 freeways. “For far too long, residents of our community have experienced its fair share of unnecessary traffic congestions,” the letter read. The mayor pointed to the improvement to regional transportation, economic development, creation of jobs and alleviation of traffic in local neighborhoods as reasons for their support. 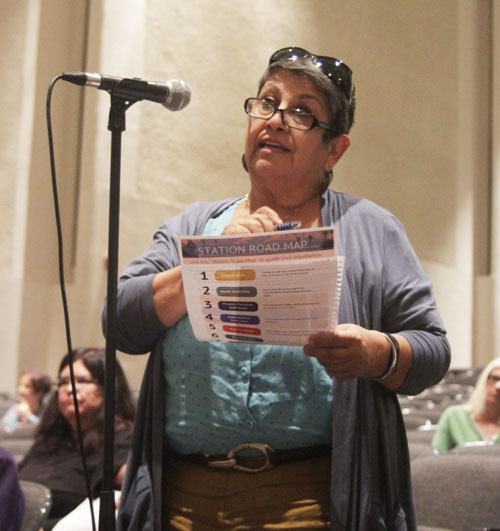 Joanne Nucklos, a longtime South Pasadena resident and member of No 710 Action Committee, told EGP she is concerned with some of the routes the alternatives propose. “El Sereno has gotten the short end of the stick,” she said, referring to anticipated disruption to local neighborhoods and businesses due to construction in the area. Several people have complained that the 120-day public comment period, which began last Friday with the release of the report, is too short, noting that entire report, including all the studies and appendices total more than 26,000 pages. Caltrans and Metro will hold three public meeting where people will be able to review the documents, including maps, and ask questions about the proposals and submit comments. Caltrans is “looking forward to receiving valuable input from communities and the public on this critically important transportation issue that has affected not only this area, but the region, for decades,” said the agency’s District 7 Director, Carrie Bowen. “The feedback we receive is a vital part of the project development process and helps inform the selection of a preferred alternative,” Bowen said. 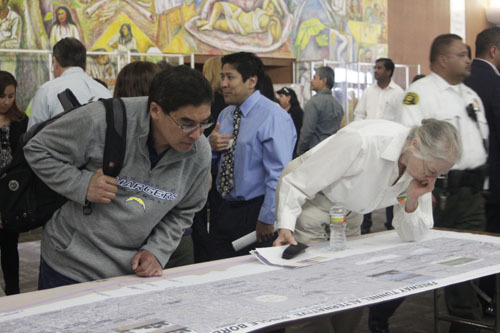 —Tuesday, April 14, at the Pasadena Convention Center, with a map viewing from 5-6 p.m. and a public hearing from 7-9 p.m.
A third public meeting will be scheduled later, according to Metro. Metro is encouraging the public to attend the public hearings and to the document at http://www.dot.ca.gov/dist07/resources/envdocs/docs/710study/draft_eir-eis . The public comment period ends July 6. 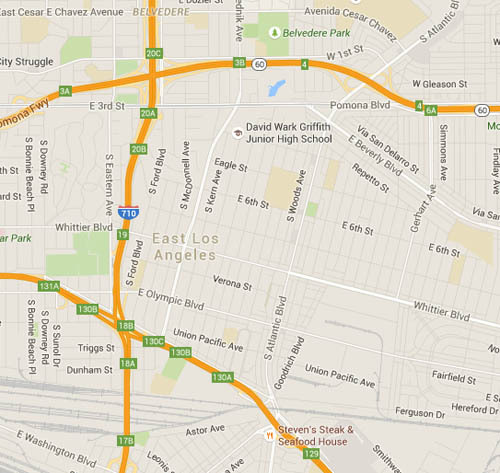 The full document can also be viewed at the Caltrans District Office, 100 S. Main St., Los Angeles, CA 90012. Copies are also available at public libraries listed here: http://www.metro.net/projects/sr-710-conversations/. An EIR is required to comply with the California Environmental Quality Act, and an EIS fulfills requirements of the National Environmental Policy Act. The laws require government agencies to identify the significant environmental impacts of their actions, and to avoid, minimize or mitigate any adverse effects. Information from public comments will be weighed before preparing the final environmental document, Gonzales said. Altogether, about 26 detailed technical studies are included in the Draft EIR/EIS, Gonzales said. 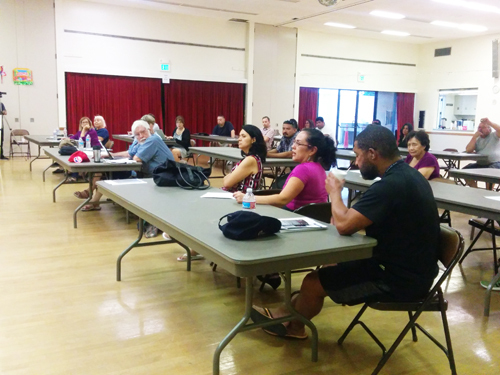 Through the process of compiling the Draft EIR/EIS, Metro and Caltrans conducted 92 community meetings, participated in six city-sponsored community forums, and held over 200 briefings with community stakeholders.